Fatin Nadhirah Muhd Royani made Infrastructure University Kuala Lumpur (IUKL) proud when she was selected as one of the recipients of the IEM President Gold Award 2018. 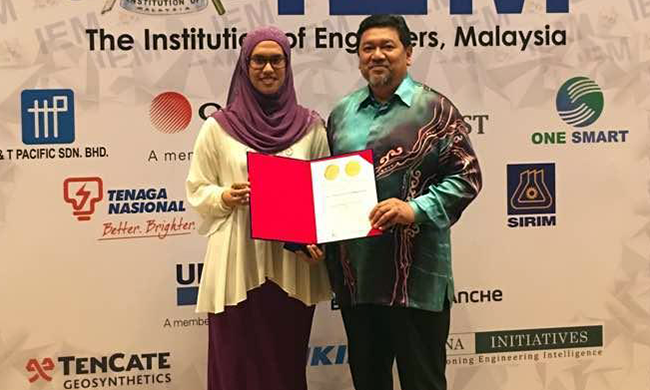 Fatin, a Bachelor of Civil Engineering (Hons) graduate from the Faculty of Engineering and Technology Infrastructure was awarded the Institution of Engineers Malaysia (IEM) Gold Award. The award was presented at the IEM 59th Annual Dinner and Awards Night 2018, held in April at the Sunway Lagoon Hotel, Subang Jaya, Selangor. IUKL President and Vice Chancellor, Professor Dr Roslan Zainal Abidin who expressed his delight during the ceremony said that this was a great achievement for IUKL and a motivation for other students to compete in future competitions. “Fatin is an excellent student and with our engineering programme accredited by IEM, we did not want to miss participating,” said Roslan. He also shared that Fatin was part of the team that won a Bronze Medal in a competition organized by the Research Management Centre with a project titled “Formwork using Damp Proff Membrane (DPM)”. The team comprised of Noor Amirah Mohd Annuar and Nik Arfiah Faten Nik Ariffuddin from IUKL. “She is also active in sports and last year she won the Women’s Single Category in the Badminton Tournament organised at IUKL,” he added. IUKL has been providing quality education and excellent professional services in various fields of infrastructure. IUKL being the foremost infrastructure university in Malaysia, aspires to produce technopreneurs and skilled manpower with outstanding communication, technological and managerial skills. Enhanced with up-to-date academic facilities, and tutored by highly qualified lecturers among whom are industry practitioners, IUKL strives to ensure high quality education in areas of Engineering, Business, Education, Communication, Language Studies, Architecture, Biotechnology, Information Technology and many more. As a subsidiary of Protasco Berhad, a company listed on the Main Board of Bursa Malaysia, IUKL is committed to engineering the future of tomorrow’s leaders. IUKL’s dedication in providing quality education has helped many students in acquiring the necessary knowledge, skills, and hands-on expertise in becoming respected practitioners in various fields. Guided by the University’s motto “For Knowledge, For Humanity”, IUKL is striving to ensure that each student is thoroughly equipped and empowered to meet future challenges by preparing them holistically today.